Kiss the frog prince and spin through the reels on this amphibious 5 reel adventure. 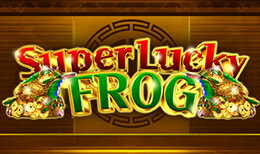 Super Lucky Frog has 25 paylines that feature a wild range of Wilds, Scatters, free spins, and multipliers. Match up symbols of different creatures from the enchanted forest and encounter three lucrative jackpots; lucky, super, and Froggy. Enjoy this simplistic online slot game and revel in the manga-style graphics while you win some slimy cash prizes. NetEnt, formally known as Net Entertainment, is a Swedish company founded in 1996. Since then NetEnt has become one of the most successful online casino software developers in the industry. In 2006 their online casino was voted as one of the top 20 online casino modules. In addition to their online casino games, NetEnt has also developed an online live dealer casino platform, and mobile gaming platforms. They also own a progressive jackpot network that has paid out tens of millions of prizes since it started. Super Lucky Frog is an anime inspired game that centres on the Brothers Grimm fairy tale, The Frog Prince. The 5 reel, 25 payline online slot game comes with 3D graphics set in a peaceful pond where cute and loveable fairy creatures coexist in playful harmony. The 25 paylines are adjustable and you have 4 betting levels to choose from. Coin values can range between 1p and 50p making this a very versatile game for any player. For example, to bet on all 25 paylines at bet level 1 and the coin value is set at 1p, you would spend 25p per spin. The maximum bet on all 25 paylines at level 4 would put you at £50 per spin, this is the highest bet playable. You also have the Autoplay function which is synonymous with all NetEnt games. You have some enchanting symbols decorating your reels, including a Frog, Fairy, Unicorn, Elf, Griffin, Troll, Ladybug, Squirrel, Butterfly, Mushroom and a Snail. The Elf is the Wild symbol and it will substitute for all other symbols except the Scatter and the Bonus symbols to help you create winning combinations. The Fairy is the Scatter symbol and when 2 or more of these symbols appear on the reels, winning combinations will payout. To trigger the Free Spins feature you will need to land 3 Fairy symbols. 3, 4 or 5 symbols will trigger 10, 20 or 30 Free Spins. Fairies also come with multipliers and multiply your bets by 2x, 4x, 50x or 400x when 2, 3, or 4 appear on the reels. Not only that, but winnings are tripled during the Free Spins feature! To trigger the Bonus game in Super Lucky Frog you will need to land 3 or more Bonus Frog symbols. This feature will take you to a marshy village which is the home to the happy creatures you see on your reels. Greeting you is the Super Lucky Frog, with his fairy wings and king’s crown, he will summon you to spin his lucky wheel. On this wheel, you have a variety of prizes including the Froggy Progressive Jackpot, the Lucky Progressive Jackpot and the Super Progressive Jackpot. You also have blank spaces and coin prizes on the wheel, adding to the excitement of the bonus game. When the wheel stops you will get your prize and then head back to the main game. Super Lucky Frog is a whimsical online slot that features all the tropes of a good fairy tale, and you don’t even have to kiss the frog to win! It’s highly entertaining with a good betting range that would suit any player, and features bonuses and stunning graphics that will make you believe you are enchanted.